The Cincinnati Riverfront Park project has landed a $1 million gift that will go to create the event lawn in Phase 1 of the 45-acre park project. The $1 million gift will be presented on Friday, April 9 at 2:30pm at the Cincinnati Parks Administrative Offices in Mt. Adams (map). The gift comes from the Jacob G. Schmidlapp Trusts for which the new Jacob G. Schmidlapp Stage & Event Lawn in Cincinnati Riverfront Park (formerly known as the Walnut Street Event Lawn) gets its name. Once complete, the Event Lawn will be built as a green roof to the underground parking garage below, and will act as a venue for special events, performances, and passive recreation. Park officials state that the Event Lawn is also being built to ADA standards so that the space will be fully accessible to all people. The Event Lawn will be immediately surrounded by pedestrian promenades, with the much anticipated Moerlein Lager House overlooking the site on the east, the performance stage on the western portion of the space, The Banks development to the north and Mehring Way will sit just to the south. 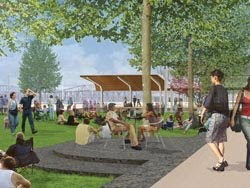 Phase 1 of the overall $60 million riverfront park is currently under construction, on-time and on-budget according to Cincinnati Park officials. The anticipated completion date for Phase 1 is April, 2011. Any chance we can get Frank Gehry to design our stage, too? Awesome gift! Cincinnati has some pretty cool philanthropists around town. I think our stage will be slightly less intense than Chicago's, but I'm sure someone at DAAP can make a call.